I initially skipped over The Mark of the Dragonfly because, though the synopsis sounded okay, the cover just wasn't pulling me in; and I've learned to trust my gut cover/synopsis-sense. (It's like Spidey-sense except, instead of physical harm, it protects me from books I'm not likely to enjoy. It's especially fine-tuned and accurate in YA.) Thankfully, Anya did a wonderful review that got me to look past the cover. The Mark of the Dragonfly is a dangerous adventure in a strange, magical world with fun characters and great friendships. The plot kept me engaged and the interactions between several kinds of crazy (and stubborn) people keeps the story moving even when they're not in mortal peril. And I loved the train! I actually had a short story back in college about a girl (with mechanical tendencies) on a long train journey, so I loved the idea and really enjoyed the author's execution of it. I like the cover more now that I've read the book and get all the subtle details in the picture, but I still wish they had done something different- something that grabbed me and said, "Pick me up!" Maybe they'll try mixing it up if they do a paperback edition. 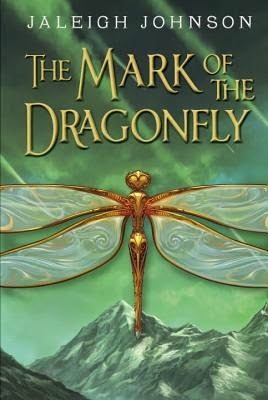 I would definitely hand The Mark of the Dragonfly to a middle grade reader (or an adult, for that matter) and, while it looks to be a standalone, it has plenty of material for an adventure trilogy or series. Yes, I can see how the cover wouldn't grab you, it does look a little dated. Cover=boring! Your review + synopsis=interesting!! I'm looking for this one! Thank you! Yes, that was pretty much my thought process when I read Anya's review. I hoep you like it!